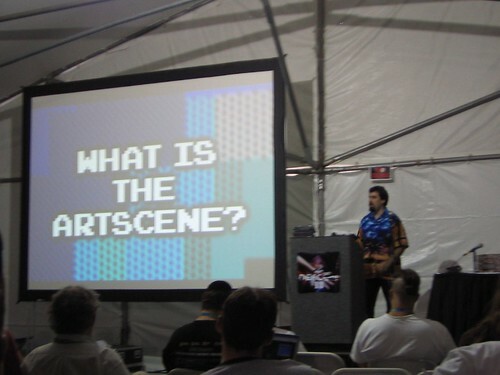 I’ve had this rattling around for a year or so; I’d like to consider making a video on how to give presentations. I generally (generally being the key word) get good reviews on my talks, and while my specific style of spun yarns and profanity-laced rant might not be the most useful template for any given talk, the general approach I take to my speeches might have use. I’ve sat through some pretty horrible speeches; speeches given by friends, by unknowns, by first-timers, and by what are supposed to be hardened veterans of presentation. I’ve also sat through electrifying speeches and monologues that leave me in a dreamy, energetic daze afterwards. It can go either way, but when it’s bad, oh boy is it bad. I totally understand speeches given to get the presenter into the conference for free; that sort of chicanery is the job of the people choosing speeches to suss out and if the person gives a sub-par presentation, it’s up to the organizers if they want to invite that person back to speak again, ever. But if the person up stage honestly and truly wants to present something to the audience, and actually believes they have something new and compelling to present, then a lack of good speaking style is that much more tragic. I would want it to be video, because it’s the visuals of a presentation, even of the presenter, that play a part. If you’re not paying attention to visuals, you’re essentially doing an audio broadcast and there’s not a lot of compelling reason for people to be in the room with you. What I find with the shows I’m involved in are that people don’t attend because the recording is more than adequate for them to get the entire “point” of the talk. If the people don’t regret missing it, then you’ve failed as a presenter. Naturally, my calendar is chock full of day job, documentary, editing and other fun stuff, but maybe if I have time I’ll put something together. That is, if people tell me it’s worthwhile to do. I’ll ask around before I run the camera. You’ve been so successful with presentations, capturing your knowledge on ‘how to do it’ would be hella-useful. I’d buy it. I’d love to see that, your speeches are wonderful! It would be nice to have a video on how to make a good seminar/speech/presentation. I too am sick of badly done presentations. But maybe some good tricks to fascinate the audience. And if the presentation is good, the live-recording is as well. At least I was impressed of Jason’s speeches about WP. Do it. I’d get it and I’d hope a lot of other people would too. Chris Crawford would be a great contributor BTW. He did brilliant presentations at the Game Developer’s Conference back when and I always attended his talks, even if his was the only one I got to and even if I had no clue what he was discussing from a technical standpoint. He had a way of explaining anything such that I always brought something valuable away from his session, even if I didn’t get 100% of it. Yes please, I’d love to check out your take on presentations.